"Attentive, thoughtful & friendly..... An impressive level of knowledge & skills.....A bespoke high-quality approach"
“I first saw Pete in September 2012 after suffering a back injury while on holiday. Pete made a very thorough assessment of my back problem. He was very detailed in his assessment of my problem and what sort of treatment I could have. He explained simply but fully as to what the benefits of each treatment would be. Along with exercises he gave me acupuncture to help with the pain. Regular consultations with Pete have helped me to stay motivated, keep up with physio exercises, and reach my goals. When I first saw Pete I was unable to walk hills without experiencing pain, could not sit for more than 10 minutes. I have recently started running again, am back on my bicycle, and recently did a strenuous hill walk - a year ago all things I was unsure I would be able to do again! "Well I can't recommend Pete Jowsey highly enough! Very professional and reassuring, not to mention effective...". 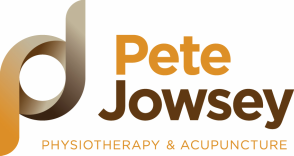 “I saw Pete Jowsey for problems with hypermobile joints causing me pain. Pete was kind, compassionate and very thorough. He was helpful and encouraged self-care but left clear instructions on how to do so. He does not create expensive dependency but sets you free to build your body back as much as you can but is there for further support if needed. His examination skills were excellent. I have already moved on with my strength and Pete provided hope and encouragement. I know I have to do a lot of the work but feel confident that if I do so Pete will steer me in the right direction to rebuilding my fitness. "I saw Pete for a calf tear. The service was excellent, very well informed in current practice, also very focused on the patient. Pete delivers a very professional service but is personable and friendly which makes for a productive therapeutic relationship that helps recovery. Pete's level of knowledge and skills are excellent. Pete’s communication skills are very good and it is easy to ask questions to aid understanding. Explanations are clear and appropriate and give a sense that your treatment is well managed. Pete is a passionate enthusiast for his subject, keeps on top of current research and has contributed to research himself. He is always keen to share his knowledge and occasionally it was a bit more than I could grasp, but only occasionally! The treatment was always focused on my recovery and restoring the injury back to full fitness. My goals were getting back to badminton and the gym and I’m back to them. I would certainly recommend Pete for physiotherapy. Pete's solid background in clinical skills, his professional approach and personal skills compare very favourably with other practitioners." “I went to see Pete when I slipped and damaged my knee. I had been in a lot of pain and hardly able to walk. Pete came to my house to see me the next day and spent some time carefully examining my knee and putting my mind at rest that I hadn't done anything too serious. I liked being told how my knee fitted together and get a better idea of how all the ligaments and cartilages worked. He gave me orders to sit with my leg up for at least a day, some exercises to do to strengthen my muscles and a realistic plan for recovery and care. “I began seeing Pete after I slipped a disc in my back. Pete is very caring and very thorough in his questioning, assessment, and in the way he explains what he is doing as he goes along. I found this to be very helpful because I was able to begin to understand what I needed to do to help myself in recovery. I felt he ‘knew his stuff’ which helped me to relax and trust him. Recently I ran another half marathon.....need I say more! This was a goal that seemed unachievable when I turned up first time round.